The ultimate confidence-builder! It's time to learn Igbo. 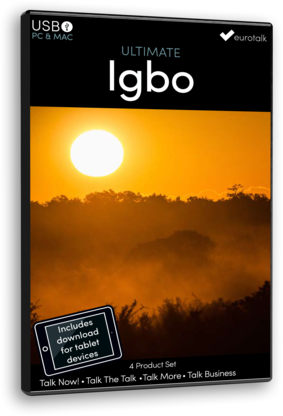 When you’ve completed this set of programs, you’ll be able to speak Igbo with accuracy and conviction. The Ultimate Set also includes a companion app for your tablet, so you can learn on the move. Hours and hours of language content, all designed to get you learning through games and practice. EuroTalk’s Ultimate Set is invaluable for absolute beginners through to intermediate learners. It contains four full programs, which will teach you first words and phrases, then complete sentences. You will develop your speaking skills, hone your accent and train your ear. Each program targets one or more of these areas. If you’re new to a language, there are some basics you will have to learn, whether you’re eight years old or 80, on business abroad or a tourist on holiday. Talk Now! Igbo offers a simple-to-use method for you to start learning the language, whoever you are.